September 5, 2013 – Osborne Industries’ employee owners helped Stan Thibault celebrate 40 years of service to the company with a surprise reception during the Board of Directors meeting on August 28, 2013. George Eakin, President and Chief Executive Officer, expressed his appreciation of Thibault’s 40 years of teamwork and innovation at Osborne Industries. Thibault, along with prominent members of the Osborne community, started the company in 1973, manufacturing a single item, the Stanfield® Heat Pad. Throughout the subsequent 40 years, Thibault was instrumental in Osborne’s development of a full-line of swine management equipment, custom-engineered plastic components for industrial OEMs, and Osborne’s small line of pet products. Thibault was presented with a Legacy Brick that has been installed at Kansas State University’s Bill Snyder Family Stadium. 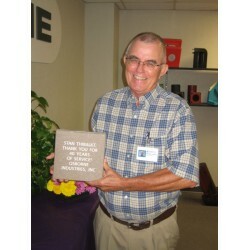 A message, engraved on the surface of the brick reads, “Stan Thibault: Thank you for 40 years of service.” The brick represents the employees’ appreciation for Thibault’s commitment to Osborne Industries and the Osborne community. In its 40th year of business, Osborne develops and markets a proprietary line of pet products including Stanfield Heat Pads and the Osborne Canine Canteen. The company is 100% employee owned and remains a major employer in North Central Kansas.